Julie Landman is widely known and admired for her 25 years as principal horn of the Metropolitan Opera Orchestra, teaching at Juilliard, master classes at horn workshops, and as a proponent of the Carmine Caruso method. 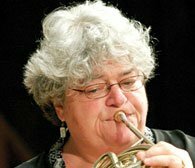 She has been a mentor and role model to many young horn players. Julie was born in 1953 and aspired to play at the Met after attending the opera and hearing Howard T. Howard playing principal. She studied at Juilliard with James Chambers, Howard T. Howard, and Carmine Caruso. After serving as co-principal in the Houston Symphony, she won the position of principal at the Met from behind a screen through the audition finals, saying later that she was convinced that she would not have won without the screen. At the Met, Julie specialized in the demanding Wagner and Strauss operas, but has also been active in summer chamber music festivals. She premiered Gunther Schuller’s Quintet for horn and string quartet in 2009. In 2015, retired from the Met, Julie is still actively teaching and playing.